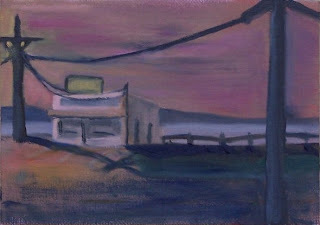 This little painting was inspired by the jazz venue at Seattle's Bumbershoot Festival last fall. The weather was beautiful--even hot. As I sat in the audience and listened, I couldn' help but notice the wonderful array of hats people were wearing. I'm looking forward to warm weather again and plenty of sunshine. 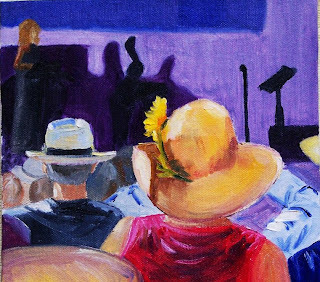 I call this painting "Hat Party." Late last Saturday afternoon, walking the shore by the North Jetty at Gray's Harbor I was taken by the way the light sparkled off the rocks and and the shadows danced across the sand at low tide. 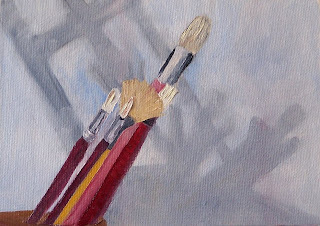 This little painting was the result. 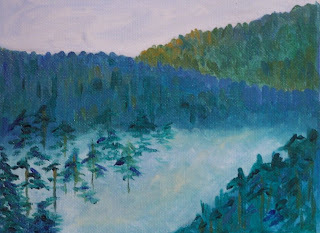 This 6 x 8 oil painting on canvas panel is a scene I enountered on my way to the Washington coast just as the sun was coming up and the fog in the valleys was still hanging heavily. It was a prelude to a a string of beautiful days and a delight after the gray skies of the past few months. 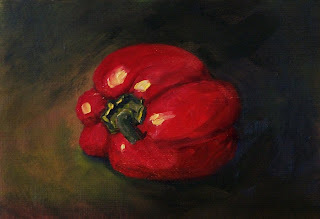 Red Bell peppers add a great dash of color to a winter time of gray. 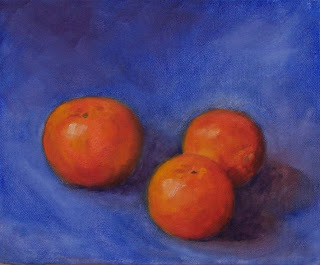 Here is a 5 x 7 oil painting on canvas panel to brighten your day. 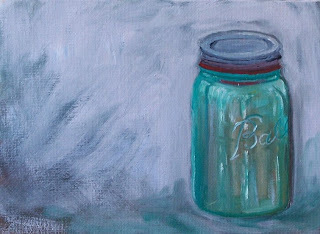 Another little 6 x 8 oil on canvas landscape is what I have to share today. Just outside the little town of Elma, Washington was where I found this flooded field with a flock of snow geese stopped for a break. They were refreshingly beautiful in the cold damp of December. 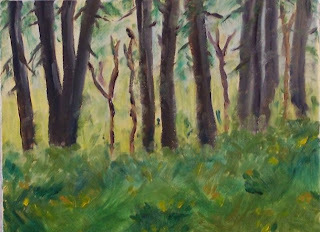 This little 6 x 8 oil painting on canvas panel is from a photo I snapped just outside of Satsop, Washington in December. It was damp, cold, and wet--a typical winter day in Washington State. 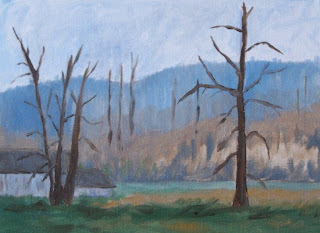 You can see more winter landscape paintings at Fine Art America. Day three on the glass jars. One is a pint and one is a quart. I know some people collect these and after painting them I can say I too find them interesting. The pint is appears older than the quart. The lids are quite different as are the shapes. This has been a fun little exercise. This painting is 8 x 10 oil on canvas covered hardboard. I hope you enjoy looking. Yesterday was the first sunny day I've seen in many weeks. 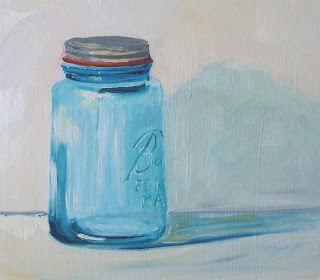 I sat this jar on a table near my window sill--it sparkled and reminded me that spring willl come again. This little oil painting is approximaely 7 x 8 on gessoed massonite. 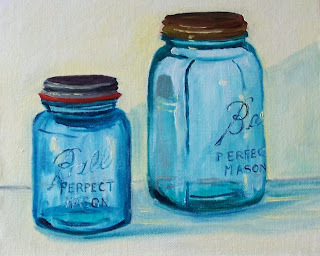 This little 6 x 8 oil painting on canvas panel is one of four vintage Ball jars I picked up at an estate sale. They're fun and funky. I haven't decided what to do with them yet so I painted one. Maybe I'll paint another--who knows. The sun was out, I was cleaning up, and this wonderful shadow appeared on my studio wall. Had to paint it. 6 x 8 oil on canvas panel. Here are some more of my groceries--a fresh bunch of radishes. 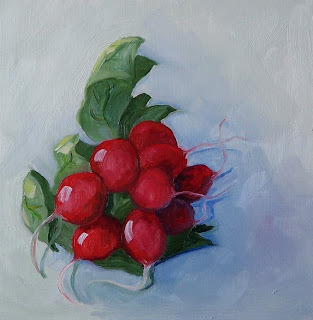 This little oil painting is 7 x 7 on gessoed masonite. Saturday is grocery day. 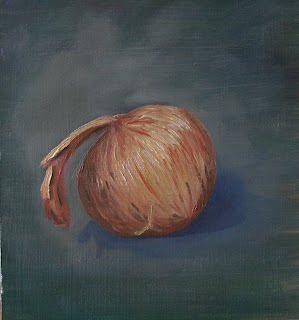 Here's some of mine--an onion done in oil on 7 x 7 gessoed masonite. The season for these little guys is ending so I thought I should take an hour or so to record their beautiful color while they are still fresh. 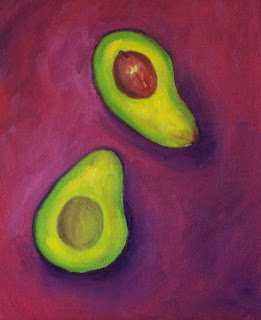 This is an 8 x 10 oil on canvas covered hardboard. 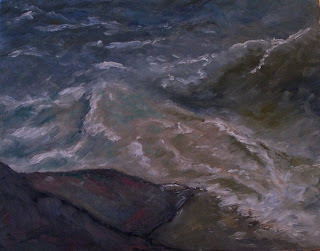 Looking over a rocky ledge into the dark and stormy sea can be intimidating. 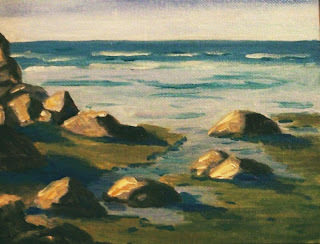 As I painted this I remembered the slippery rocks and the cold, angry waves. 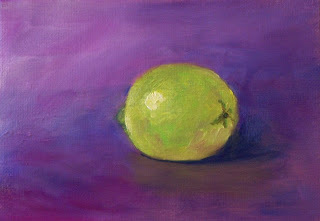 I think I have captured that sensation in this 8 x 10 oil painting on canvas covered hardboard. 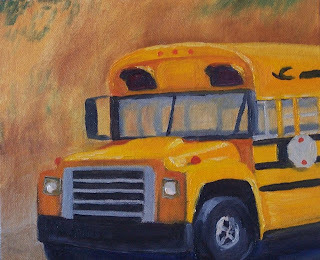 An old-fashioned school bus parked on the side of the road on a sunny day. 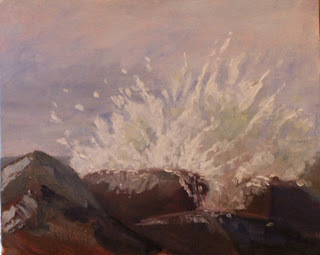 This is a painting of the water splashing over the North Jetty at Gray's Harbor in Washington State. It is a typical winter day on the coast--cold, wet, and windy. 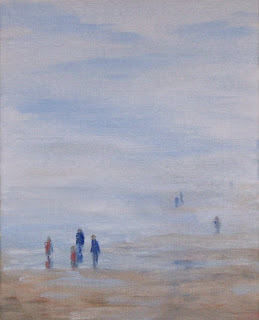 Today's painting is a foggy day on the Washington Coast. 8 x 10 on canvas covered hardboard. Apples are a good winter fruit--very famous in Washington State. 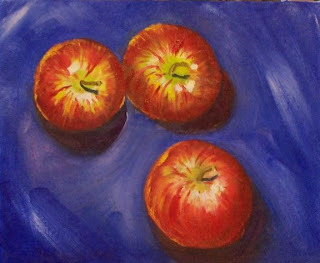 Here's today's contribution--Gala Apples on a blue cloth. Oil on 8 x 10 canvas covered panel. I had fun with this little painting. 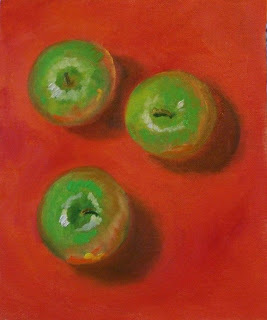 Three Granny Smith apples on an orange cloth. 8 x 10 oil on canvas covered hardboard. 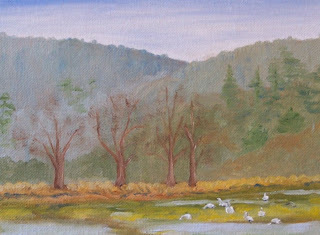 This little 6 x 8 painting on canvas panel is based on a photo I took last fall at the Snake Lake Nature Preserve in Tacoma. From the path that circles the lake, I looked through the trees and saw a wonderful glow of sunlight. The path is closed now as they are widening Highway 16. I look forward to it reopening again when the road construction project is finished. It is a delightful little getaway right in the city. This is Johnny's Fishmarket at sunset--a landmark in Old Town Tacoma. 4 x 6 on canvas panel.